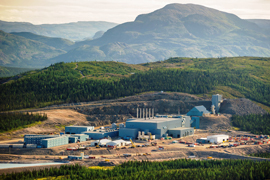 Voisey’s Bay mine is a surface nickel mine located on the northeastern coast of Labrador, 21 miles southwest of the town of Nain and 50 miles northwest of Natuashish. Copper reserve price was calculated by the operator at $2.76 per pound. Nickel reserve price was calculated by the operator at $5.31 per pound. Cobalt reserve price was calculated by the operator at $18.37 per pound. Royalty calculation is in dispute. We have not received any revenue since fourth quarter of fiscal 2016.